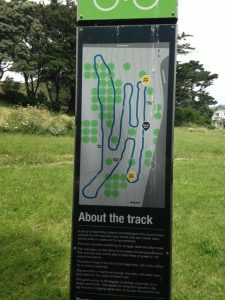 Towards the south coast of Wellington, just north of the Island Bay shopping area, this bike track allows kids to test their skills on a dirt track without it being too difficult. If your child(ren) are used to BMX tracks, this one might be a bit easy for them, but for those that aren’t pros, this might be a good place to practise skills and gain confidence. There are bends but they’re not as sharp as on a standard dirt track, there are some rollers but they’re child-sized so good fun for a novice. Kids need to be able to use steering to some degree and their brakes. The 600m track is graded so that the bottom section is easiest and should be manageable by riders of all levels, while the top section requires navigating between trees. The info boards near the entrance have lots of useful advice that parents can share with their kid(s) to help them improve. While bikes of all styles and types are fine for this track, scooter riders will definitely find it challenging. The dirt track is next to a skatepark although not close enough to actively monitor a kid at each. The playground at the other end of Island Bay between the Esplanade and Reef Street or the Marine Education Centre (only open on Sundays), are both close to this bike track if you’re wanting to make a visit here into more of a day trip. Address: Adelaide Road, near the corner with Dover Street, opposite Wakefield Park, Island Bay. There are parking places on the main road.